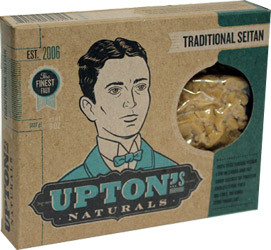 Now you can use Upton’s delicious seitan in it’s unflavored form for your own creations! This delicious and tender seitan is a perfect meat alternative for your favorite recipes, packed full or protein to help you create your best meals ever. 8 oz. (227g) package is $3.99. **NOTE** - If you receive this item and it has a stamped date that appears to be past expiration, do not be alarmed as the product is still fresh. The date is for stores who sell this item as a refrigerated product where it has a shorter shelf life, but we store it frozen until shipping, giving well beyond 6 months life past any stamped date. Once received, you can keep refrigerated for up to a month (prior to opening, please use within 1 week of opening), or, re-freeze for up to 6 months. From Anonymous of Chicago, Illinois on 3/31/2010 . Absolutely Love Upton's Seitan! Recommend the flavored seitans as well! Allergens This item is manufactured in a facility that also processes wheat and soy.